Published in the December 16, 2016 Santa Maria Times. 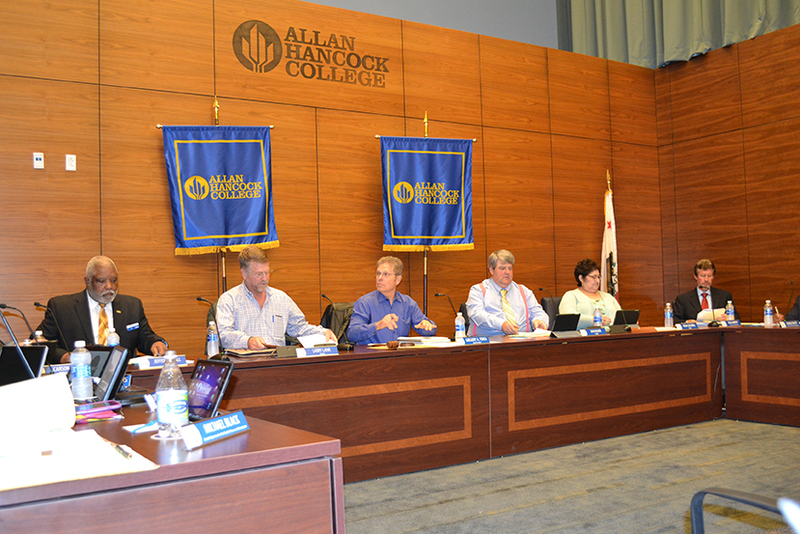 While the results of the Allan Hancock College Board of Trustees election may not be earth-shaking, they do reflect not only a seismic shift in the composition of the board, they also show what a few determined people can do when they set their minds to it. 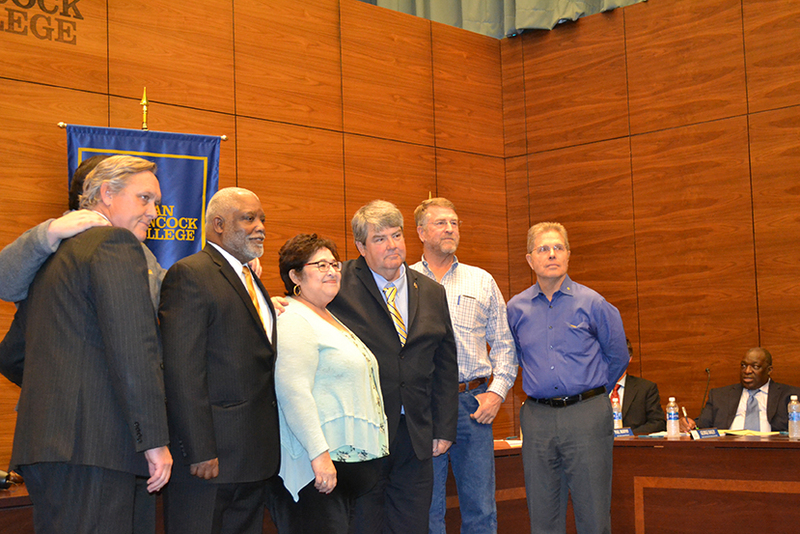 The final vote count gave the two candidates supported by the Part-Time Faculty Association, Jeff Hall for Area 4 and Dan Hilker for Area 2, victories, defeating incumbents. Their victories were especially meaningful to the PFA. 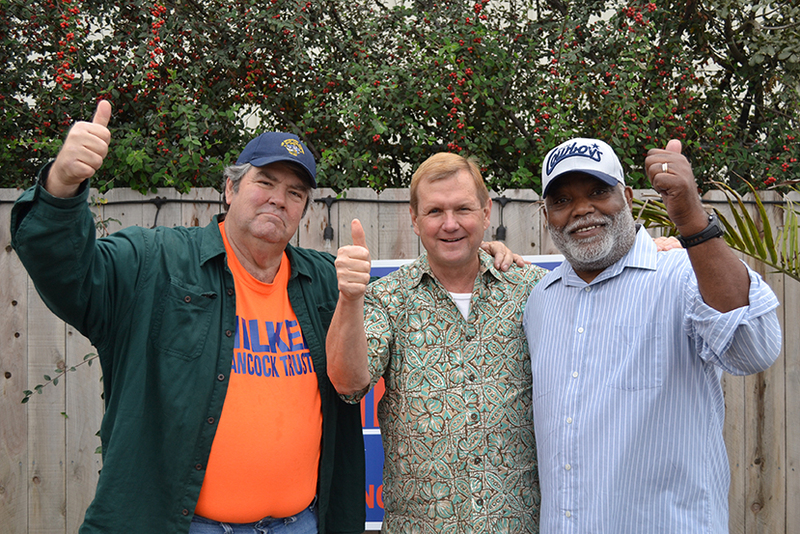 For only the second time we as a union decided to go out on a limb and get involved in a political campaign. Much was at stake. Defeat would put us at an even greater disadvantage when we deal with the college administration and the board of trustees, but victory would mean an enormous change in the balance of power. Why take such a risk, some may ask. Why not just let the status quo continue? For years we have been treated with polite contempt by some members of the board, and undisguised disdain by other board members and the administration. Statements by the college president that they have trouble finding dedicated part-timers, when dozens of our members have put in 20-plus years at Hancock, statements by board members that no one lost their job during the Great Recession when many part-time academics were let go during this time, convinced us we actually had little to lose. But the deciding factor came last June, when as part of ongoing arbitration, an attorney on behalf of the district filed a legal brief in which she asserted the opinion that the California Education Code supersedes our collective bargaining agreement, and as a result, the college administration only had to honor those parts of our contract it wished to. Our contract, fought for and won through 15 years of sometimes bitter, oftentimes stressful bargaining sessions, was meaningless as far as she was concerned. It is hard to imagine a worse insult to us. To say that our collective bargaining agreement is essentially trash was a greater affront than we could bear. And while it must be said in fairness some members of the administration have distanced themselves from this, they have refused to repudiate it, and as far the PFA is concerned it is still the official position of both the board and the administration. The Rubicon had been crossed. At the PFA we felt that if this is truly the way the administration and the board feel about us, if they are willing to stand behind this legal opinion that so blatantly insults and degrades us, then we have nothing to lose. Another factor in our decision: In the 17 years since our union was formed, relations between us and the administration have never been worse. While they have been strained at times in the past, both sides realized it was important to keep the lines of communication open. Once again, we felt we had nothing to lose and everything to gain by getting behind the two challengers. The PFA hopes that by changing the composition of the board we can improve conditions not only for us but for the entire campus community. If nothing else, we have shown what a few determined people can accomplish. 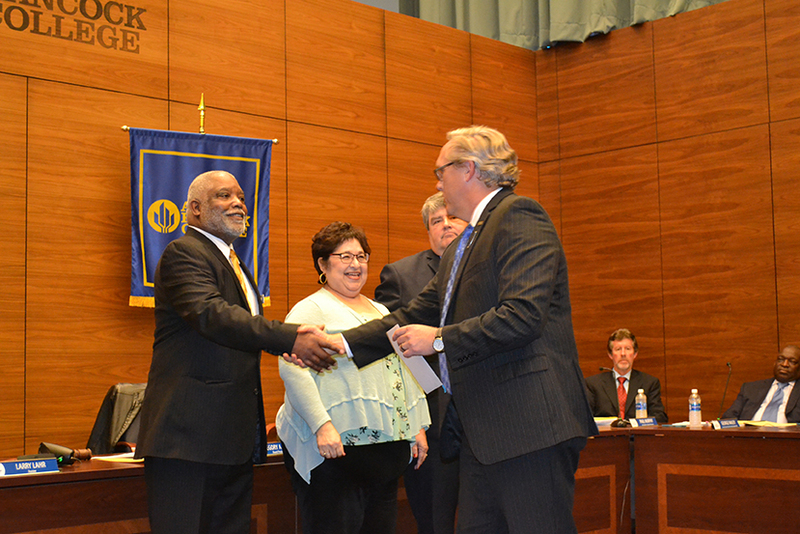 The following pictures were taken at the Allan Hancock College Board of Trustees meeting on December 12, where Dan Hilker and Jeff Hall were sworn in. 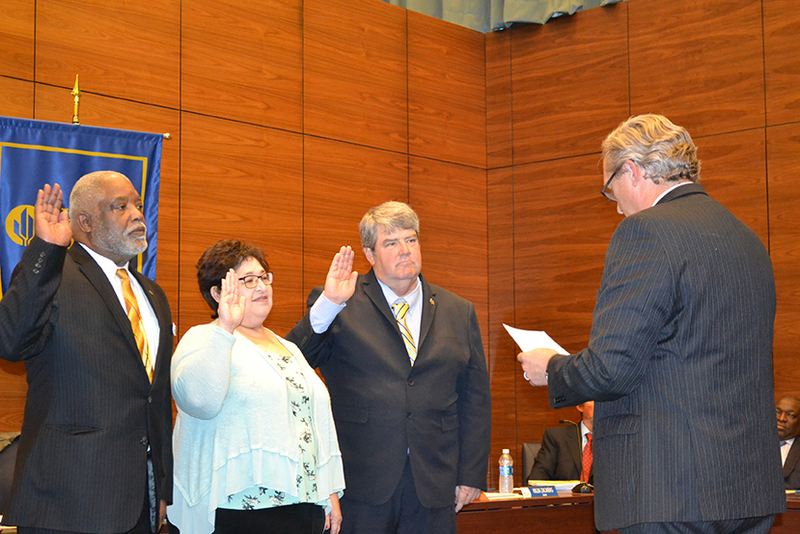 Hilda Zacarias was also sworn in after running unopposed. 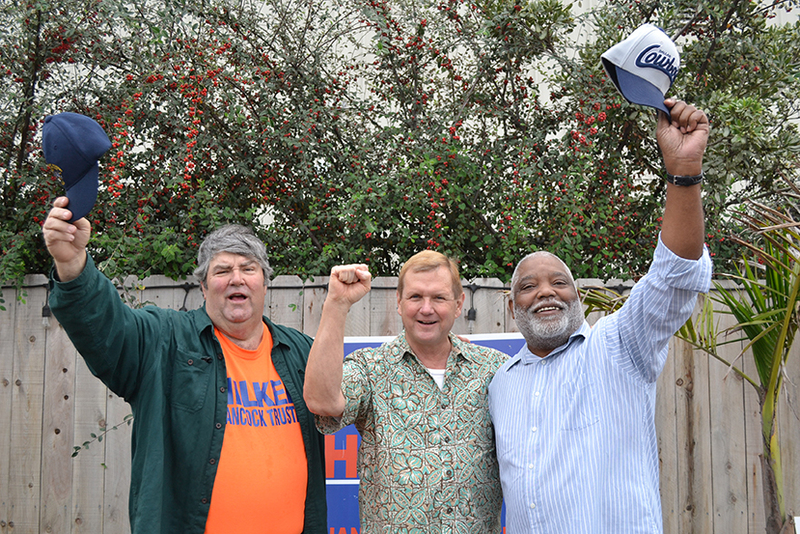 Also shown are pictures of Mark with Dan Hilker and Jeff Hall at a victory celebration.